Designed for use in outdoor, long-range point-to-point and point-to-multipoint network configurations, the WBS210 N300 2.4 GHz Outdoor Wireless Base Station from TP-Link provides a solid foundation for a reliable wireless network connection. 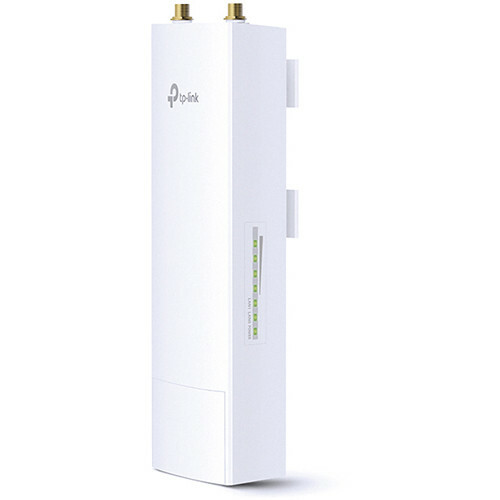 This wireless base station supports the 802.11n Wi-Fi network standard and operates on the 2.4 GHz frequency supporting data transmission distances of up to 30 km when used with a dish antenna. Installation is easy and can be accomplished without the need for any tools, thanks to the dual RP-SMA female connectors. Once connected, the WBS210 Base Station can operate in a variety of conditions thanks to the weatherproof enclosure, and it even includes 15 KV ESD protection. The TP-Link WBS210 comes compatible with the Pharos Control Centralized Management System, providing network administrators with the tools needed to monitor and manage just about any aspect of the network including device discovery, network status, firmware upgrades, and more. Accessing the network management utilities has also been greatly simplified thanks to the web-based management system which is accessible directly from a web browser. Box Dimensions (LxWxH) 10.7 x 6.0 x 4.3"